NOTE: This is a late post, and I apologize to my editors for not promoting the November 2013 issue of T+L Southeast Asia early enough. But between dealing with the aftermath of supertyphoon Yolanda (international name: Haiyan) plus all the traveling we did in November, there hasn’t been much time to catch our breath! Many little girls dream of becoming mermaids. Not too many, though, take the mission to heart. Philippines-based Anna Oposa is different. Her business card reads “Founder and Chief Mermaid of Save Philippine Seas,” and at the tender age of 25, she has already helped expose a smuggling ring that poached the country’s waters for corals, sea turtles and other precious marine species; started an independent movement to protect aquatic resources across the archipelago; and taken her mission to the international stage as a Young Global Shaper of the World Economic Forum. This woman’s love of the ocean is so deep, all she’s missing are flippers. Here, we dive into her underwater and on-the-ground pursuits. Which came first—your love of diving or your passion for conserving the environment? When I was 19, I volunteered in a cleanup dive to be exempted from an exam, and I saw diapers underwater. That’s when I told myself I needed to do more. The interests complement each other perfectly. I am reminded of what needs to be conserved every time I dive. This is an excerpt only. 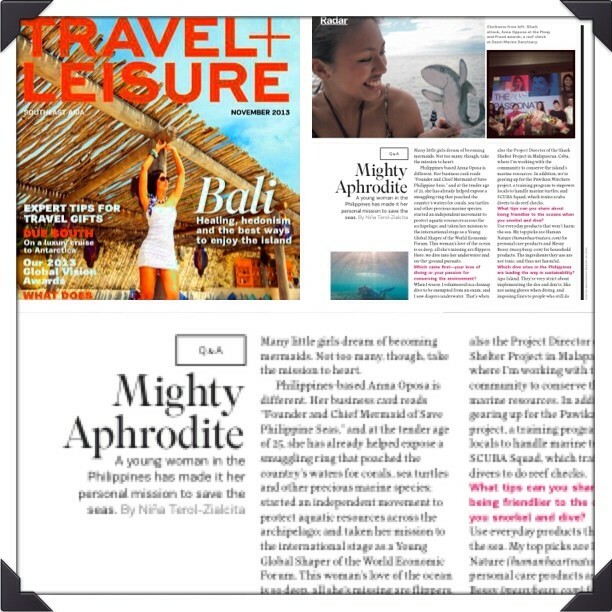 To read the full article, grab a copy of Travel + Leisure Southeast Asia’s November 2013 issue.